I really like the idea of a dual caliber rifle. There are times when being able to easily switch out the barrel on your weapon depending on the type of shooting that you intend to do can come in really handy, so needless to say I was rooting for this weapon to work. Unfortunately, the mechanism by which this is accomplished boils down to an allen bolt in the bottom that is holding the barrel on. This wouldn’t be a problem in and of itself, except that the damn thing keeps coming loose. Not from extreme actions or even moving around a whole lot, just from shooting it. So what ends up happening is that you shoot a couple of times, the bolt start to loosen, and then when you fire the barrel wobbles and your shots go wild. And I mean really wild. At its worst, I was feet off of the target, and that’s something I shouldn’t have to worry about. I was able to get some better grouping with an artillery hold, but why on Earth should I be limited to just one hold in order to get the rifle to do what it’s supposed to? The bolt isn’t the only part on this gun that becomes unreliable with repeated use. 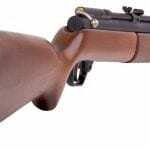 For example, you have to use these rubber O rings on the barrel in order to make sure they have a proper seal when you switch them out, but the things blow out every 15 to 20 shots. What good is a weapon like this if I have to stop and fix it every few shots? This is just one more part that, in order to make this dual caliber just doesn’t seem to handle actual use very well, and it’s incredibly disappointing. One thing I will say is that this gun is really powerful for what you’re getting. With a single pump you’re getting speeds around 1000 fps and I can shoot through a number of different targets from pretty far away. Getting the right ammo is key to this, though, and again we see a failing with the gun in that if you’re not using the correct ammo, you’re not going to get the same results. What’s baffling about that is that it seems that the “right” ammo is different for nearly everyone I’ve seen, and while there’s a fairly universal “don’t use Crosman”, what you actually should use is all over the map. I found that Raptor ammo worked pretty well for me, but who knows if it’ll work for you for some reason that I couldn’t say. It is a powerful rifle, and while the pump is pretty hard on this one, it makes sense considering the strength you’re getting behind it. I also still like the concept of it being dual caliber and the tradeoff between those isn’t too bad when it’s shooting correctly. It’s a loud gun, but not so much that I would consider it prohibitively so. This gun feels almost like a novelty in that Beeman was trying to sell a gimmick, so they rushed it out the door without adequately testing it or making sure that their craftsmanship was of any quality. It goes wildly inaccurate very quickly and requires so much effort just to get it to work the way it’s supposed to. I read one review that said, “After a dis-assembly, cleaning, honing of cylinder, de-burring of sharp edges, a little spring tar and some moly lube, I have one heck of rifle.” If you’ve got to do that much work just to get the damn thing to shoot straight, then it’s not “one heck of a rifle,” it’s a waste of your time and money. Rarely have I been so disappointed in a rifle before in my life, and I’m not sure this review expresses that disappointment fully. What an incredible waste of a really great idea, and it’s all from a lack of care in production. Sure, you can spend a few hours working on it to correct the shoddy job Beeman did, or you can get a Marksman 1073 Grizzly X2 DC Air which has some of the same problems, but not nearly as many. Or just resign yourself, like I have, to getting the best .177 and .22 you can, separately, and forget about being able to switch barrels. Funny that you say that about the Barrel. I had mine sitting inside for over a year and never shot it, had the .22 barrel on it. So I went out shooting last week and decided I’d bring the beeman just for fun, at first I was very pleased with the power and accuracy, shooting from 100 yards away or so. But I noticed my shots were all over the place a few shots later. Needless to say, the bolt started loosening itself. And I mean the shots were all over the place. Other than that, I absolutely love the gun. It’s a cheap fun thing to do especially here in California where gun laws are stupid. Great review. Hi kevin how are you? I am Gbon from Bangladesh. I want to buy a Beeme dwell clever air rifle? How do buy it? Please answer me. My friend has one. Its has never dome that. Ever. I mean ever. No thread locker, none of that. Just good old fashioned muscle I guess. But sean’s is 2 years old now. Still every bit as accurate with both sizes and every grain. 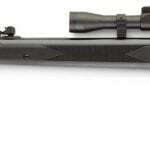 Given the relatively low cost of each individual caliber rifle, why on Earth would anyone want to fool around with interchangeable barrels? If you have to carry an extra barrel around you might as well just carry another rifle. With the issues that you have highlighted this gun shouldn’t even be in production. I have a powerful 0.177 Break Barrel that does everything I want it to do. All I have ever done to maintain it is to clean it and oil it. Yes, it was about $400 (that was 25 years ago) but worth every penny. Yeah, well it’s call the price of having to buy TWO really good Rifle Scopes, better rings, accessories, etc, rather than have ONE Rifle’s worth of Expensive Scope and Accessories and switching barrels. I had a Silver Kodiak before and while I liked the rifle looks and feel, I hated the Springer noise, This rifle is NOW a Nitrogen Gas Piston and has Beeman’s “Quiet Tek” built-in silencers for each barrel. It’s a bit quieter, certainly not as loud as the Silver Kodiak. I’ve not yet experienced the Barrel locking ALLEN SET SCREW work it way out dramatically after a few shots (it’s not a “bolt”, jezz do you people not know a set screw from a bolt???) It will get a little loose after 25 or 35 shots, but good grief, suffer a little and carry a Allen Wrench big babies for the nice feature of not having to lug along TWO rifles of diff calibers instead of an extra barrel in your backpack! What whiners. After seeing my buddy’s Benjamin (?) PCP .22 air rifle I got the itch. Found your site last night and have enjoyed the articles. Bought a Beeman Silver Kodiak X2 Dual Caliber! Then I got home and read this article LOL. Well it was only $100. Hoping I don’t have the same issue as the RS1. I’ll try to remember to post my experience tomorrow. Too dark to shoot now. Thanks for the great information! To quote “I read one review that said, “After a dis-assembly, cleaning, honing of cylinder, de-burring of sharp edges, a little spring tar and some moly lube, I have one heck of rifle.” If you’ve got to do that much work just to get the damn thing to shoot straight, then it’s not “one heck of a rifle,” it’s a waste of your time and money. I disagree with you Bill. Apart from honing the cylinder I have all other work done on every rifle I buy, even the high end ones. My Weihrauch HW97, HW77 and my AA TX200 where different rifles after having some basic work done them. Out of the box the HW97 and HW77 were absolute dogs and very ruff compared to how they shoot now after some work. The TX200 was a lot better out of the box but still benefited from the above mentioned work. I just bought a gun called The Beeman Quite Tek Dual Rifle (same idea). It is awesome, as long as you adjust the scoop it will work well. It has great power. It went through my shed’s hard wood wall. Your story was really inritmafove, thanks! I have the been an sportsman r2 series. It is a 2 barrel model and I have only had the 22 in. I cannot hit the same spot twice. Barrel screw comes loose. So disappointed. It has me very cautious about any air rifle now. Consistency was/is my biggest issue. I’ve yet to find the magic bean (pellet) that will stay in the same circle over 4 shots. I gave up on brake barrel and went to under lever. I get this out one in awhile at the .177 caliber just to use up pellets – less pumping that my Crosman pistol. All ways had guns. but in UK, your only guns if you if you had land were .22 shell. type and air rifle’s. now in Canada I am looking for some thing for pigeons goffers, beavers etc. on the golf course. suggestions please Alfred. Oh grow up and learn a few gunsmith skills. Degrease it and using some blue Loctite, is all it takes. Use some faucet o-ring grease on the o-ring, and buy some extras for around a penny a piece …. stop crying. Things are gonna’ alright ‘lil girl….. Geeze….What ? Are you a Me-llenial. I have had a Beeman Silver Kodiak which is basically the same gun with minor cosmetic differences. I experienced the same trouble with the Allen screw holding the barrel secure in the Breech block too. However over time and with some real heavy effort tightening this screw the barrel has been completely secure for a good year and a half and thousands upon thousands of rounds through it. This much the same with scope mounting screws You need to really bear down when tightening them and with a little bit of time and a few tightenings they remain dead tight. I’ve been using dual caliber RS1 and RS2 for several years. I always have the .22 barrels installed and never had them loosen up. Accuracy has been good, although I typically shoot 10 to 15 meters. Good power, although only one consistently does 700 fps; the other two are about 680 fps. Advertised speed with .22 pellets is 800 fps. Overall, a good training rifle with real rifle feel, including weight.